I'm quite blown away by how well this mix works as an unofficial alternative soundtrack to Richard Burton's captivating narration. Do not miss. "When I was 8 or 9 years old I heard Jeff Wayne's musical version of H.G.Wells' 'War Of the Worlds' for the first time. It scared the pants off me. For years afterwards I listened to the record over and over. It is certainly one of the things from my childhood that cemented my interest in film scores. Though not a film score per se. Its marriage of rock music with orchestral arrangements to tell a story, had me transfixed. The combination of funky rock with sinister string parts would heavily influence and partially shape the sounds that, years later Jake Wherry and I would be making in The Herbaliser. A few years back I was given, as a Christmas gift, the 'Collectors Edition box set of Jeff Wayne's War of the Worlds'. As well as tons of interesting facts about the creation of the original recordings it had several CD's of alternate takes, remixes etc. On one CD, I excitedly discovered that they had included all of Richard Burton's dialogue parts, without music. Having already created and performed an alternate live DJ score to silent film 'The Lost World' from 1927, this seemed like a great opportunity to do a similar project with one of my favourite childhood stories. Using records from my own collection of movie soundtracks and other suitable material, I created the original version. This was given to some close friends as a christmas present in 2010. The version you are now hearing is a somewhat revised and extended version, created specifically for the 25 years of Solid Steel. Also, it is the 75th anniversary of Orson Welles' infamous radio play, that when broadcast on Halloween 1938, had many Americans convinced that they were listening to a genuine attack from outer space. This is by no means intended as an improvement to Mr Wayne's recording but a tribute to H.G Wells, Jeff Wayne, Richard Burton, Orson Welles and of course Solid Steel. I just downloaded it and oh my God it took everything in me to not listen to the entire recording, very compelling! I want to wait to save it for later in bed so I can listen to it on my stereo with the lights dimmed. Thanks for all your work. I have several mp3 copies of Orson Welles' Mercury Theater, so when I saw this on your site I couldn't resist my curiosity. I can't wait to hear this. Thanks very much! It's without doubt my favourite listen from last year. I'd recommend picking up a hard copy of the Orson Welles recording. It's public domain so there's plenty of them around (or used to be) and very reasonably priced. I've got a double CD set with The Mercury Theatre's Dracula somewhere on my shelves, must dig it out for another listen soon. In general, I'm strongly biased against tinkering (or remaking) a classic story or film. In this case, the DJ who blended these fine soundtrack and Library tracks with the story, atmosphere and tone of Richard Burton's cadence and rhythm, did a wonderful job. In my opinion, this audio doesn't detract from the original story, but manages to get stuck in the ear of the listener. Perhaps the years between the actual beginning of the project and completion are a good thing, allowing the editor to carefully take their time in finding just the right tracks and in blending the music with the tone of the story. This story is an excellent way to spend an hour, and a real keeper. 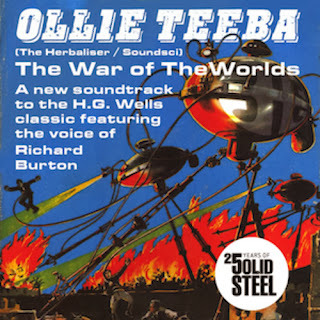 I think this wins because of DJ Cheeba was able to utilise the bonus tracks of expurgated Burton monologue included on the collectors edition of the album, then after a few more listens I noticed how closely the cues mirror Jeff Wayne's original score... lovely stuff. Those links you mentioned should be working again now by the way. Thanks again for your kind words and interest!